From the early hours of the morning of Monday, September 4, different meteorological entities and media worldwide gave the terrible news that after only few days after Hurricane Harvey, United States and the Caribbean were going to be affected by a powerful category 5 force, named Irma. Hurricane Irma in a matter of hours took its devastating course ashore for the first time on the Leeward Islands. Barbuda, one of two major islands in the nation of Antigua and Barbuda, is to date, the island that more damage and destruction reported. According to the local authorities, more than 95% of the infrastructure was destroyed. According to CNN, Prime Minister Gaston Browne described the damage as "unprecedented" and "absolutely devastating," estimating it will cost $100 million to rebuild. On Wednesday, September 6, Irma was whipping with strong hurricane winds to Puerto Rico. The island had already given the emergency signal in advance, executing an action plan in order that the nation's residents will take the necessary measures to protect themselves. Puerto Rico Gov. Ricardo Rossello recommended to Puerto Ricans to "take Hurricane Harvey as a lesson" and evacuate unsafely homes, declaring a state of emergency on Monday, activating the National Guard. The Dominican Republic and Haiti began to feel heavy rains on Wednesday 6, while Irma was passing through Puerto Rico. But it was not until Thursday morning that the hurricane began to affect the northern part of the country. After Dominican Republic, the hurricane will head for the Turks and Caicos and the Bahamas. A hurricane warning is in effect for the Dominican Republic, Haiti, the Bahamas and the Turks and Caicos Islands, and hurricane or tropical storm conditions also are possible in parts of Cuba. 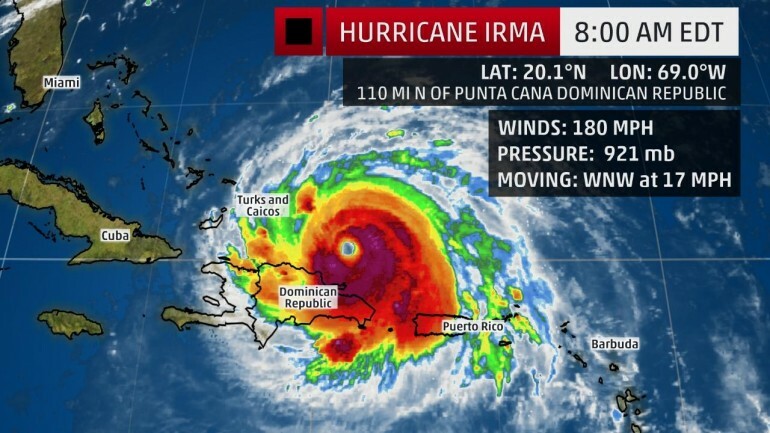 The Weather Channel reported Irma has maintained an intensity above 180 mph longer than any storm in Atlantic basin history, based on data from NOAA and Air Force Hurricane Hunter aircraft, after being steady for an astounding 35 hours. CNN said that the unusually powerful Hurricane Irma left at least 10 people dead, including six on St. Martin, two on St. Bart's and one in Barbuda, on Wednesday. At least one confirmed death in Anguilla, according to the Caribbean Disaster Emergency Management Agency. The National Hurricane Center said that the mountainous northern coasts of the Dominican Republic and Haiti will receive up to 15 inches of rain, plus dangerous flooding and mudslides. After seven years, Irma is one of three active hurricanes in the Atlantic basin. Jose, is still in the open Atlantic far to the southeast of Irma, and hurricane Katia is in the Gulf of Mexico. It is still unclear the possibility that Irma will make landfall in the U.S, but the alert increases as forecasts show the storm will turn towards Florida. Gov. Rick Scott said An estimated 31,000 people have already evacuated from the Florida Keys as of 6 p.m. of Wednesday.